Do you know baking bread at home is like a child play if the yeast god behave well with you. I love baking bread myself at home, obviously bread is one of our staple food after rice. Though i do bake variety of breads, am yet to try Sourdough breads. However baking bread by ourself will definitely makes everyone at home happy. Needless to say that baking is quite a stress burster, my today's post is Broa aka Portuguese corn bread, this bread is traditionally made in Portugal and in Brazil (where it is traditionally seasoned with fennel). Not like the Usual cornbread, this broa is made with a mixture of cornmeal and wheat or rye flour which is leavened with yeast. 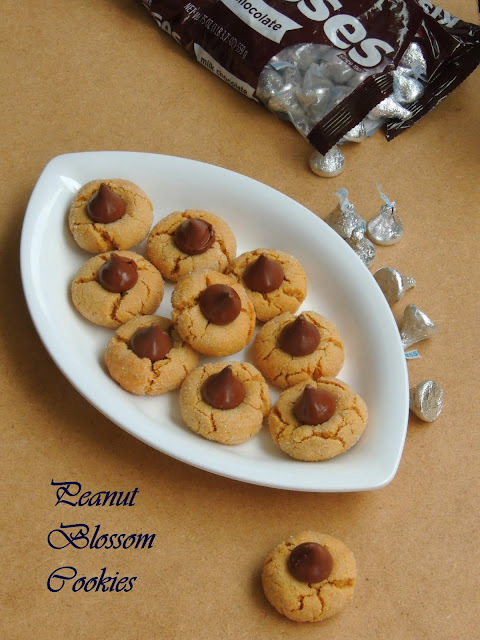 Hershey's kisses, this bite-sized pieces of chocolate are the most wanted ingredient for making this Peanut butter blossom cookies. Actually this cookies is a kind of holiday cookies which is quite a hit among kids. Hershey's kisses have a distinctive shape which looks like a flat bottomed tear drops, this chocolate are wrapped in aluminum foil with a narrow strip of paper protruding from the top. I have been looking for baking this cookies since ages as i couldnt spot out this famous Hershey's kisses here. Finally i decided to drop the idea of baking this cookies as i dont have any other option apart than planning a trip to USA to get these cuties. But fortunately my cousin sister who is living in Michigan travelled to Paris during christmas holidays asked me whether i need anything specific from US. Obviously i didnt hestiate a second to ask her few stuffs which is quite a hard task for me to get them here. She brought me this Hershey's kisses,the original bundt pan with few more baking stuffs. Awamat are tiny deep fried potato donuts balls which tastes absolutely fabulous. A yeasted potato dough when rolled as small balls are fried to browned crisp, then coated with a simple sugar syrup makes this cute balls. 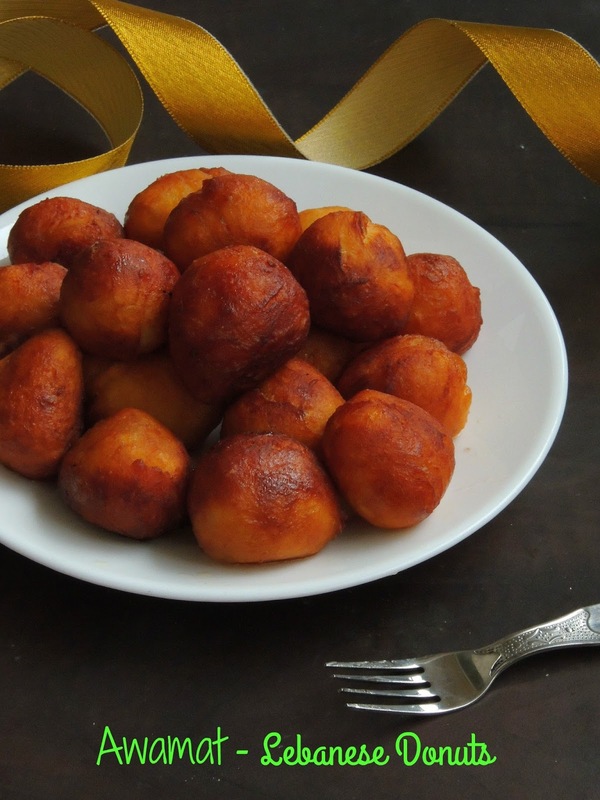 This deepfried donuts balls are Lebanese potato donuts which suits prefectly for any occasions. Since these cuties are dangerously addictive, you cant just stop with one. Make sure to make enough of this crispy beauties if you are planning to make for a get together or else for a kid's party. Trust me kids will devour this deep fried cuties without any fuss, though they are dropped in sugar syrup after frying, these Awamat have a super soft inner and bit crispy outer. However i simply enjoyed thoroughly making these potato donuts at home with simple cooking process. 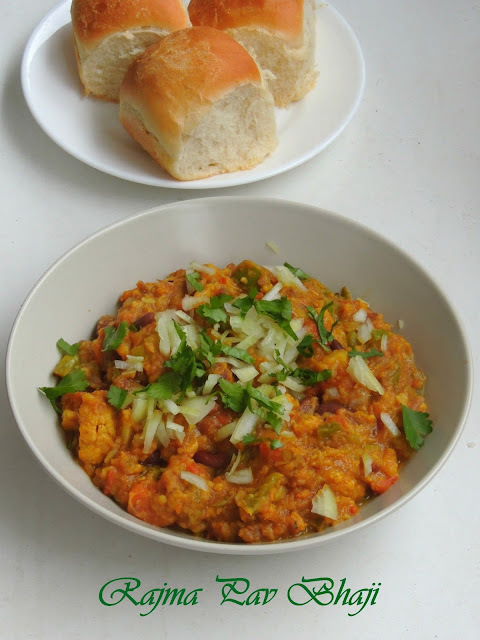 Pav bhaji is a quick meal or snack which is quite easily available in every street corner of Mumbai.I miss seriously Indian street foods here, especially Pav bhaji,the popular Mumbai street food. If i crave for street foods, i dont have any other option than preparing myself at home.However i dont hesitate a second to prepare those ultimate street food from the scratch at home.We dont get street foods easily here, even if we get them we dont have much choice to pick,obviously its better to prepare ourself at home rather than craving for it. Since making Pav and bhaji at home was not difficult, i dont miss making this ultimate street food whenever we feel like having them.Pav is the dinner rolls and Bhaji is a blend of vegetables cooked in spiced gravy. 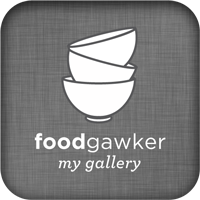 Both served together makes this incredible street food. Biriyani, this one pot meal is our all time family favourite, served along with simple raita, we just love this flavourful,aromatic one pot meal without any fuss. 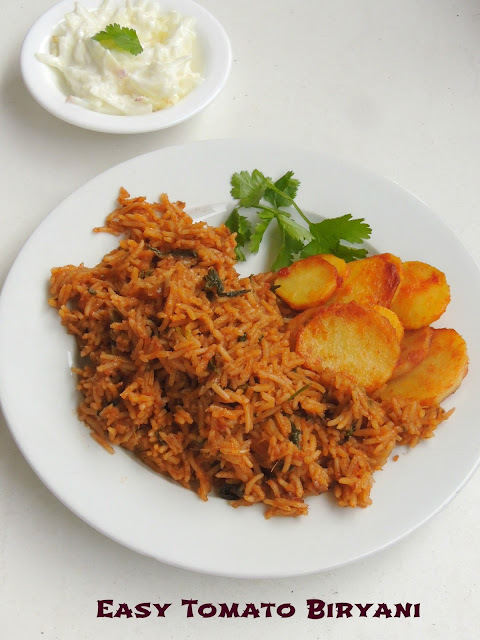 Tomato biriyani is my lil one's favourite and he just love this delicious rice with simple potato roast or else with onion raita. He asked me recently to cook some tomato briyani for our sunday lunch and i couldn't resist to his request, immediately i prepared this quick meal with ripen tomatoes along with usual spices. Usually i prepare briyani with coconut milk and this time i skipped coconut milk and replace it with fresh yogurt. 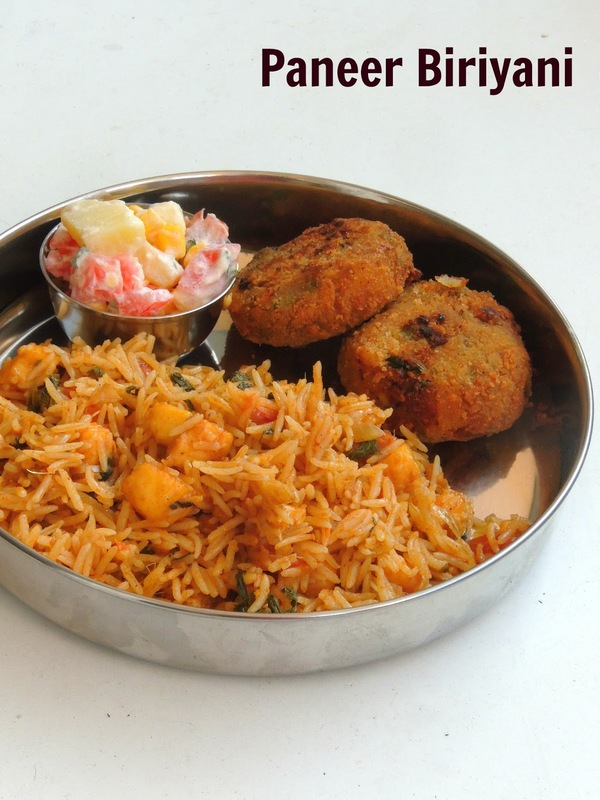 Needless to say this biriyani taste simply awesome as it goes for an easy cooking process. Though pressure cooker works awesome for preparing this biriyani, i prepared mine with a large non stick vessel which works prefect as well. 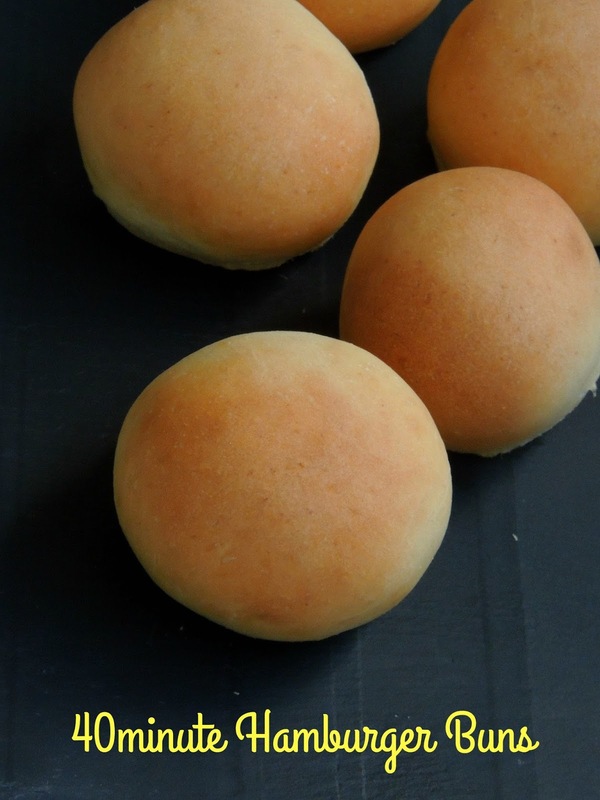 Earlier, if someone would have asked me whether i can bake some buns from a yeasted dough within less than an hour?, i would have said 'a big no', but now i can say 'YES', all because of this incredible hamburger buns. This buns gets ready less than an hour, approximately 40 minutes, how wonderful na. You can simply assemble all the ingredients and put in together to make this dough,especially if you are using instant yeast. No proving nothing,though active dry yeast can be used in this buns. Very easy to make,this buns goes immediately for shaping the buns once the dough gets ready and no need of letting them sit in warm place for an hour to double the volume of the dough. 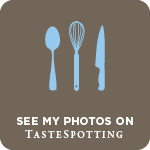 As i told earlier, this week's blogging marathon's theme is Top 100 recipes from Taste of Home, obviously i picked three incredible recipe from this list. After a spongy,airy and light hot milk cake, my today's post goes for an another simple but yet a delicious baked potatoes. This scored potatoes are easy to dish out, this scored potatoes will definitely makes you super happy if you are a great fan of potatoes. Potatoes, this vegetable is our family favourite and my vegetable basket will always have this vegetables, obviously if i dont cook potatoes atleast twice a week everyone will definitely ask for some fries. This scored potatoes was our recent favourite as this dish goes for baking. Its a guilt free dish, one can have this mildly spiced scored potatoes as a side dish or else along with their favourite sauce. 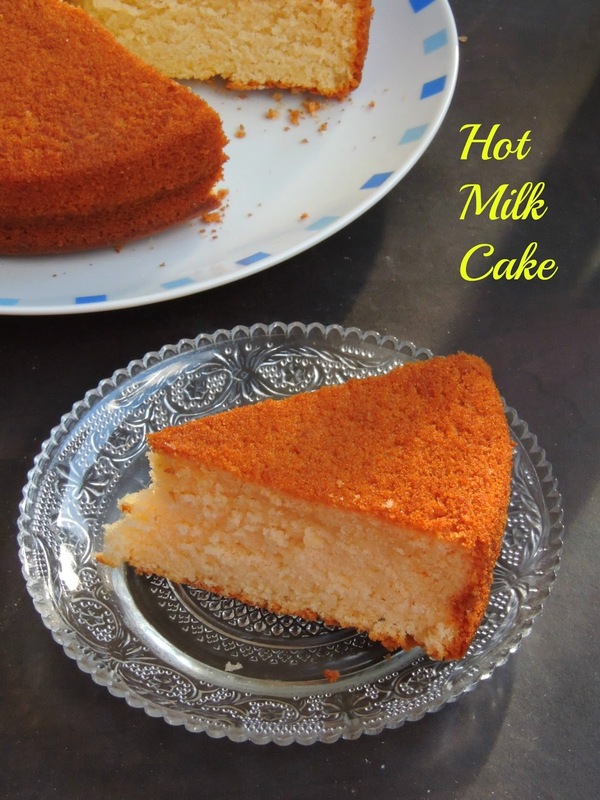 Hot Milk cake, yes this cake calls for hot milk, trust me since ever i baked this super spongy cake, this cake goes directly to our favourite cake list. This incredible hot milk cake is quite easy to whisk out and the end result is an ultimate spongy, airy and very light cake. As much as like simple vanilla cake, this cake goes for simple ingredients and the eggs plays an important role in this cake. Pale fluffy whisked egg and sugar when beaten together gives an excellent airy texture. Actually this cake is one among the old fashioned cake,came out extremely moist and they stays prefect for several days when conserved properly at room temperature. 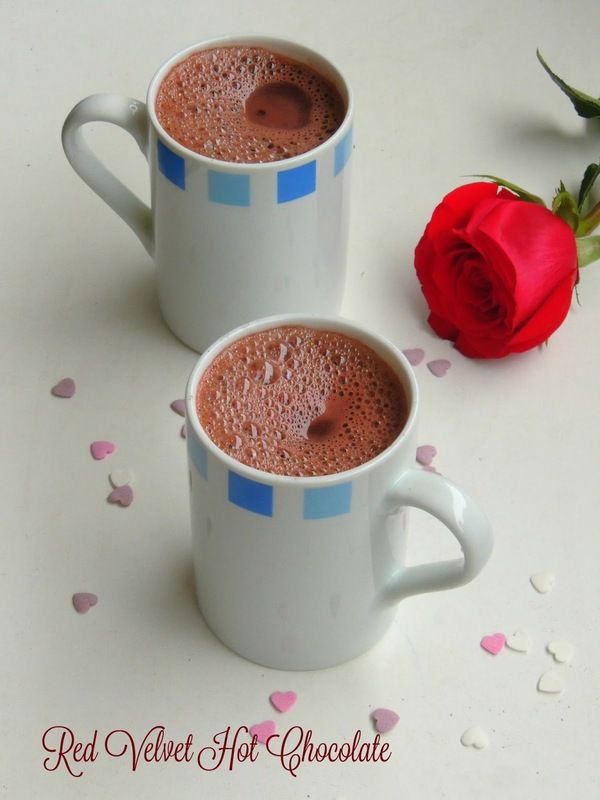 If you dont have time to make something special for this year's valentine's day you can still prepare a quick and catchy hot chocolate to enjoy with your loved one. Actually this hot chocolate can replace very well if you would have missed baking red velvet cake to celebrate this day. This red velvet hot chocolate calls for easy ingredients, some prepare this chocolate with chocolate chips while some goes with cocao powder. Its all depend upon you and your pantry, if you dont have chocolate chips just go with the cocao powder, its works awesome too. My today's hot chocolate goes for chocolate chips, obviously with less efforts you can just whip out this pretty catchy hot chocolate. Am sure most of us are getting for the V day, fortunately this year Valentine's day fall on Sunday, obviously am sure this day is going to be super special for few of us. Though for me everyday is valentine's day, i dont wait or ask for anything special from my better half. 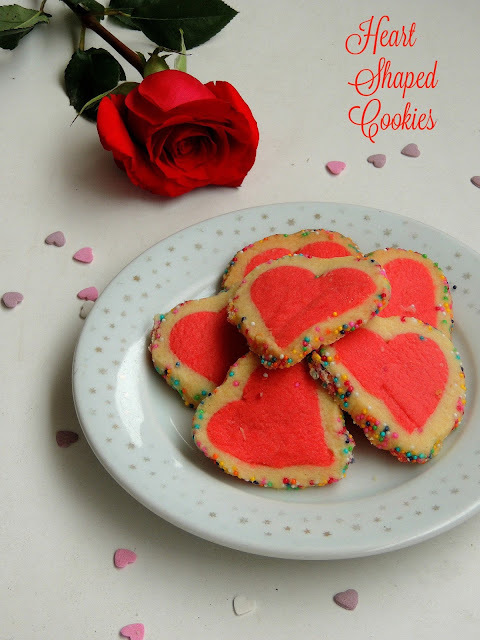 This is how we celebrate our V day, by the way if you are searching for an irresistible, buttery and dangerously addictive heart shaped cookies to munch with your cup of coffee or tea for this year's valentine's day brunch, dont forget to give a look to this recipe. This butter cookies are super attractive, very colourful and super buttery with simple ingredients. When i was searching for a different drink to post under this week's blogging marathon, i got hooked to this interesting, aromatic and very refreshing Thai version of Iced coffee. This iced coffee calls for simple ingredients and cardamom is a must for making this coffee. 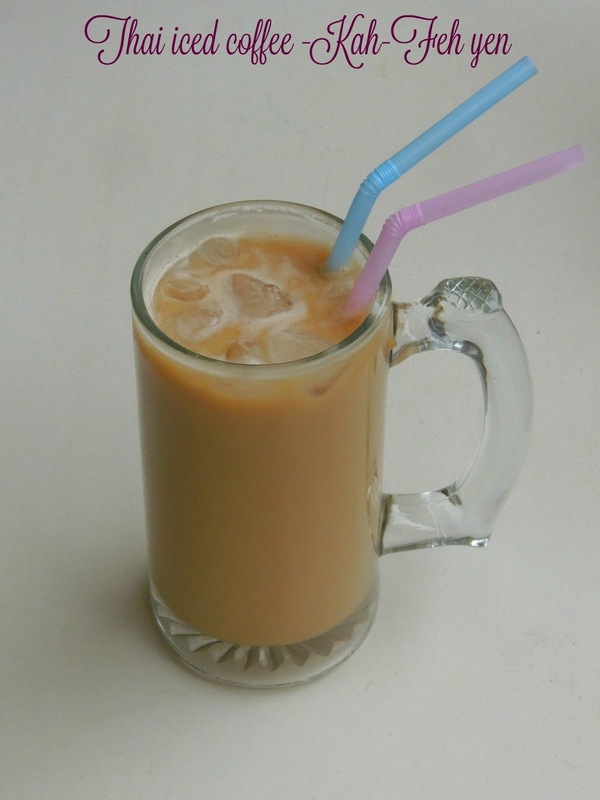 This iced coffee can be served very well with your favourite meal or else simply to enjoy with your summer brunch or else to serve for a summer breakfast, you have so many options to have and enjoy this drink thoroughly. Though several versions exists, this beverage goes for coffee, spices, sugar, milk or heavy cream (half and half) or else condensed milk. Trust me, this iced coffee is an excellent beverage to enjoy thoroughly while its too hot outside. We all know that a Cappuccino is an Italian drink prepared usually with espresso, hot milk and with milk foam. 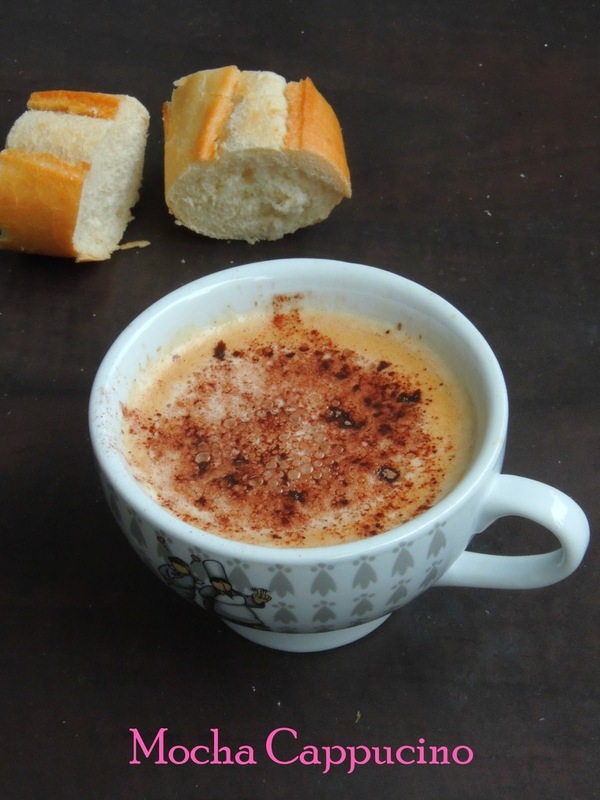 Though cream is usually used in this drink its often topped with cinnamon powder. Cappuccino is usually prepared with an espresso machine, but if you want to make it at home without any specific gadgets like espresso machine you can still make this fabulous drink. Cappuccino is traditionally served as a small serving with thick layer of foam, obviously if you are a coffee lover its better to make your own dose of cappuccino at home with less efforts. If you are searching for a prefect summer breakfast drink or a drink for a lazy sunday summer brunch, just check this beautiful iced coffee float. Yes this drink asks for just three ingredients, yea coffee powder, water and vanilla icecream. With these simple ingredients you can make this ultimate drink with less efforts. This iced coffee float is one of my favourite drink, its been a while i had it at starbuck's coffee and finally i simply whisked out at home to enjoy this ultimate drink. You doesnt need any gadgets to make this refreshing coffee drink. 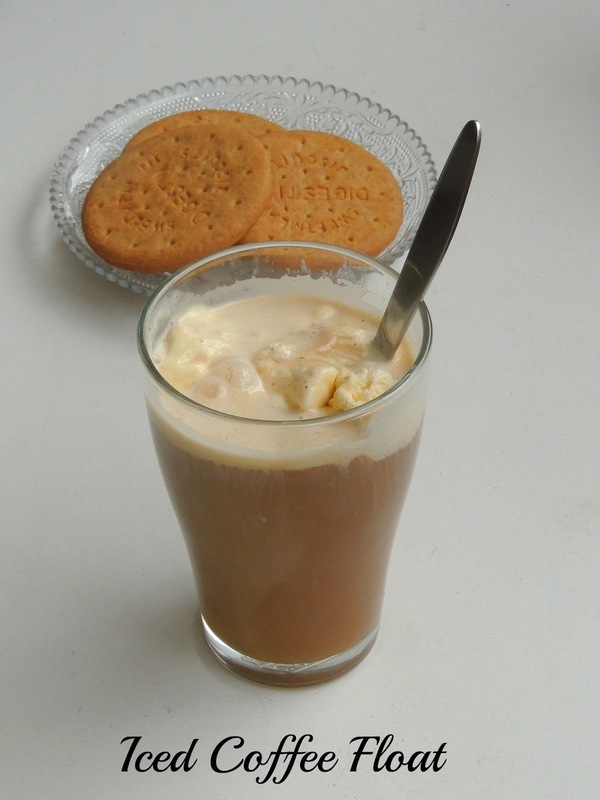 Though i used store bought vanilla icecream, if you have homemade icecream dont forget to make this fabulous coffee float. If you are looking for a Special bread for Valentine's day, dont forget to take a look at this brioche bread. This bread is quite easy to shape and trust me you can shape them quickly without any difficult. Actually i have been looking for heart shaped bread and i got this pattern from Pinterest. 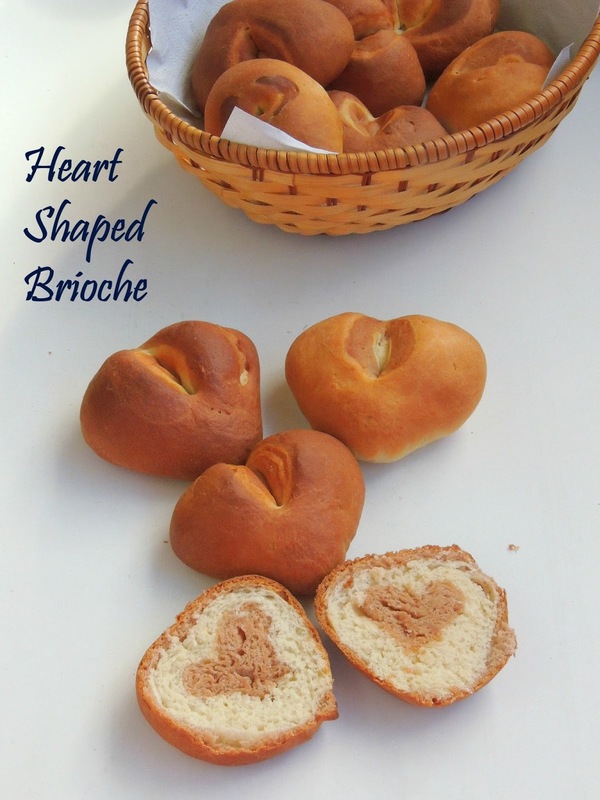 Its a Japanese site and thank god, the author shared some stepwise pictures for making this heart shaped brioche.This brioche dough asks for chocolate bread dough and usual brioche dough. Instead of using unsweetened cocoa powder, i used nutella spread to make the chocolate brioche dough. Obviously we doesnt need any spread to have this brioche, though my kids enjoyed thoroughly with nutella again. Am a great fan of jackfruit seeds and whenever i get an opportunity to cook with this incredible seeds, i dont miss the chance to cook with. We get this Jackfruit seeds very easily in Indian groceries and this seeds have their own place in every grocery. Since this seeds are highly delicious when cooked as side dish or in gravy, i dont forget to get them whenever i go to Indian grocery. Back home, i usually peel the skin and cook them in water,then conserve them in my freezer to use them whenever i want to cook with them. Trust me, this method works awesome and quite handy to cook with this seeds. Whenever you feel to cook with this seeds, just throw the already cooked and freezed seeds to your gravy or else in your curry. But my today's post was made with fresh jackfruit seeds,yes i prepared this dish few months back during my India trip. I have been baking with sweet potatoes for a while and everytime anything baked with this incredible root vegetable gives excellent baked goodies. 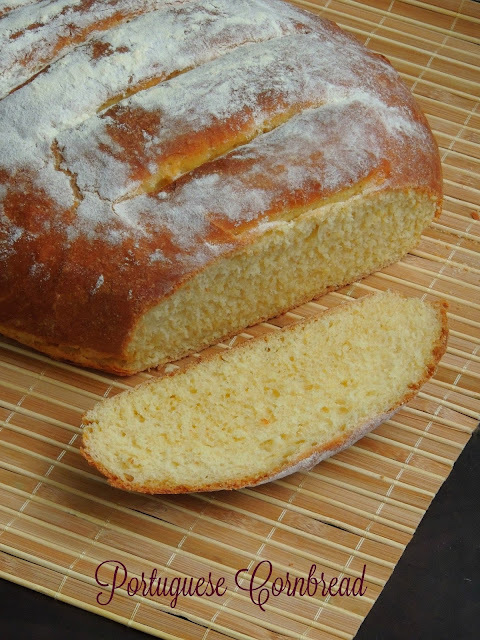 The cooked sweet potato puree works awesome if you want to bake eggless breads,cakes or buns. 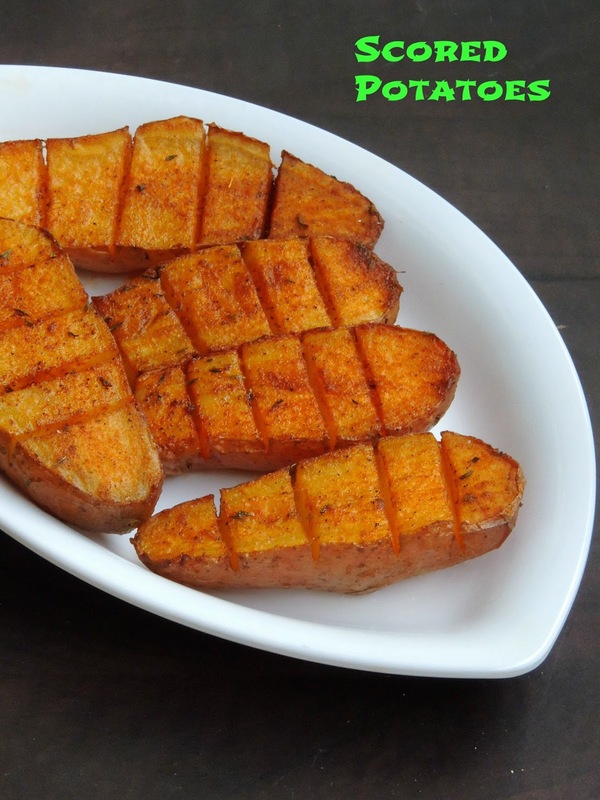 Sweet potato is one among the versatile vegetables, i love to cook with it quite often. You can dish out varieties of foods with this vegetable and you wont regret dishing out many beautiful dishes. 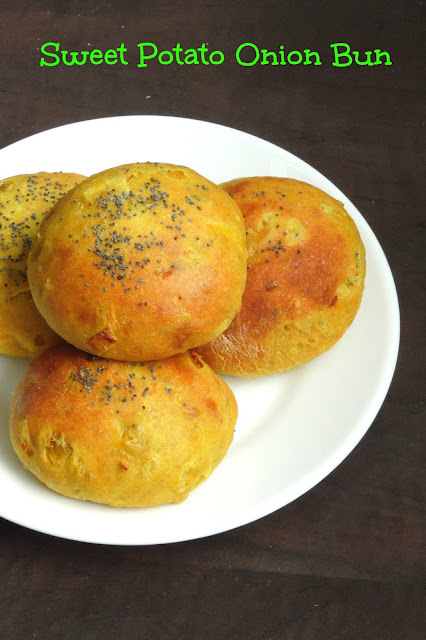 My recent trial with sweet potato is this incredible savoury buns, which sounds almost like the popular khara buns. This buns asks for sauteed onions,green chillies, since i ran out of coriander leaves i have completely skipped it, but still you can add this herbs if you have them. This cute buns makes excellent burgers, or else to make a sandwich with your favourite spread or grilled meat. You can serve these buns to have along with a bowl of warm, comforting soup.However this buns are seriously interesting to have along with your cup of tea with spicy spread or herbed cream cheese. 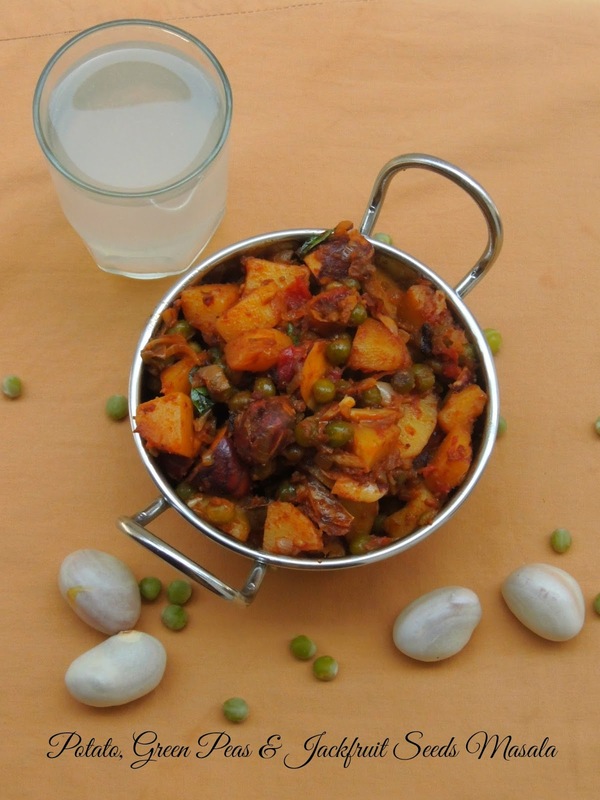 South Indian breakfast is uncomplete without chutneys, varieties of chutneys are served along with crispy dosas or softy fluffy idlis for breakfast or for dinner. Obviously South Indians makes many variety of chutneys to serve along with breakfast dishes especially for hot steaming idlis.If i serve idli for our dinner, my husband will definitely asks for atleast for two chutneys. Whenever i make Crispy dosas or idlis, i dont have any excuse to dish out atleast more than a chutney. If you check my space, you can see many varieties of chutneys, though i have many combination of chutney to give a try i still have few more to cook and post in my space. Needless to say that i couldnt stop myself to give a try to this incredible chutney with some fresh curry leaves. 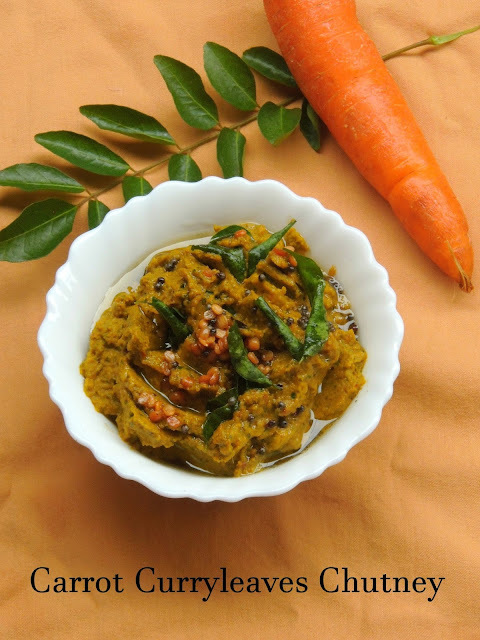 This flavourful chutney came out simply awesome.